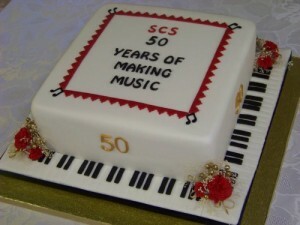 Major celebrations were held in 2009 to commemorate its 50th anniversary. These included a thanksgiving service at St Michael and All Angels Church, Steventon, followed by afternoon tea in St Michaels Hall complete with a piece of birthday cake. September 1964, serving until February 1971. In 2000, he stood down after a three-year spell as choir treasurer! But he still sings in the tenor section of the choir. In 1995, members of Steventon Choral Society received national coverage with an appearance on television in a BBC2 documentary, The Messiah from Scratch, at the Royal Albert Hall organised by The Really Big Chorus and conducted by the legendary Sir David Willcocks. Messiah from Scratch, which celebrated its 25th anniversary in 1999, is an annual event for charity with all proceeds from programmes and collections going to the British Heart Foundation. impromptu rendering of the Hallelujah Chorus on the coach, getting off the coach and inside the Royal Albert Hall itself! With the televising of the 50 minute programme during the Christmas period, we achieved a brief moment of glory and then it was back to normal rehearsing in Steventon Village Hall. The Messiah from Scratch on 24 November 2000 was a night to remember for our musical director, Terry Pearce. A donation to the British Heart Foundation by a friend gave Terry the opportunity to conduct the assembled massed choir and orchestra for the Hallelujah Chorus. decided to phone a friend. British Heart Foundation came out and announced John’s generosity and made him stand up. He also announced that John had nominated his friend Terry to conduct for him. I then had to take a long walk, which seemed to take an eternity, from my seat on the stage down to the conductor’s rostrum at the other end of the arena. I arrived at the rostrum, but before climbing up, I shook the leader of the orchestra’s hand and said, “I’ll give you three four”. Then, the proudest moment of my life. I stood there on the rostrum where so many of the world’s greatest conductors have stood. I was aware of a figure standing to my right. I looked round and there was Sir David Willcocks. I shook his hand and he said, ‘There are two batons there, please use one of them’, then he was gone. I picked up the baton and then realised I was standing on my own in front of The English Festival Orchestra and four thousand singers. I raised the choir to their feet and just prayed I wouldn’t let anybody down. I looked down at the orchestra and saw that they were all looking at me. I was aware that my mouth was completely dry. Three four and they were playing. Third bar and the choir is singing. What a sound, and they are all under my control! Letter B and I must bring in the tenors, then the altos, finally the basses. Letter C must sing and play quietly, they do it, brilliant, loud again. Bring in the basses. Will the tenors get their top A? Not a problem. I am aware that it is going well and gradually the nerves are receding and I’m feeling more confident. All of a sudden I turn the page and to my horror I discover it is the last one. I don’t want it to end. I’m enjoying it. We come to the final Hal-le-lu-jah, I bring the choir off.